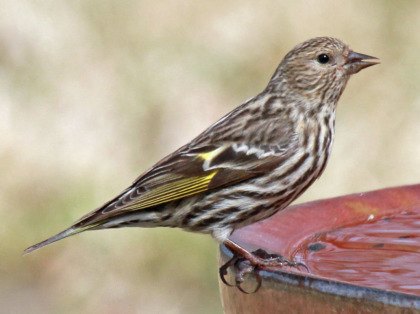 Where to find it: Pine Siskins have been leaving their summer haunts in the boreal forests and have been passing through Connecticut in large numbers recently. Over the past weekend, Lighthouse Point Park in New Haven recorded more than 3,000 siskins migrating past the hawk watching station. Pine Siskins are considered an irruptive species, meaning they only leave the northern forests in years when food supplies are scarce. This year seems to be at least a partial irruption year. Siskins can turn up anywhere in the state, but when there are favorable winds out of the north-northwest, check coastal sites such as Lighthouse Point Park in New Haven, Hammonasset Beach State Park in Madison, our Coastal Center at Milford Point, and especially areas with abundant seeds. Siskins prefer the seeds of pines and spruce, but eat a wide variety of others including, birch, alder, and many weed seeds. Flocks will readily visit bird feeders, and are especially attracted to thistle. How to find it: As Pine Siskins often travel in large noisy flocks, it is quite helpful to learn their characteristic raspy “Zree” call note. Visit coastal sites on good migration days and listen for the call. If they’re migrating, be prepared for quick glimpses as flocks often pass through without stopping. For more satisfying looks, check areas with abundant spruce and pine cones, elder and birch thickets, and weedy fields and community gardens where they may stop to feed. What it looks like: Pine Siskins are small brown finches that are white below with brown streaks. They are similar in size and shape to an American Goldfinch, but have a thinner more pointed bill and a deeply forked tail. Their wing feathers are edged in yellow and, in flight, they show a bold yellow strip across their open wing. What if the bird isn’t there: Any area with abundant food supplies will draw birds. Check and recheck favorite haunts and explore new areas with appropriate habitat.